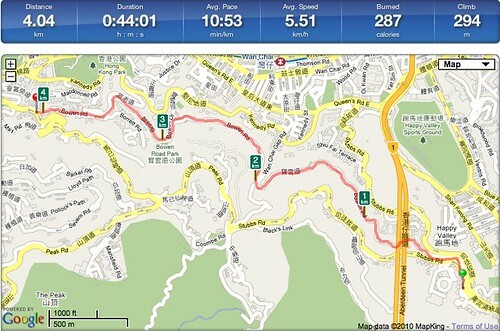 Well at least along Bowen Trail RunKeeper pro is most accurate. Today I started from the first milestone and returned to the start using both Garmin and Nike+ app at the same time. After that I walked 4k from the first milestone to the Central end using RunKeeper Pro app for iPhone. I think A-GPS is probably best in the city and Garmin should do better in open air route. Notice also from the map above how close my track was on the route, I just can’t understand why Nike+ GPS is so lousy on the same phone and platform. This entry was posted on	January 9, 2011 at 1:31 pm	and is filed under Uncategorized.